← Tomorrow – Rainbow Lecture! WANTED: Allies for Transgender People! 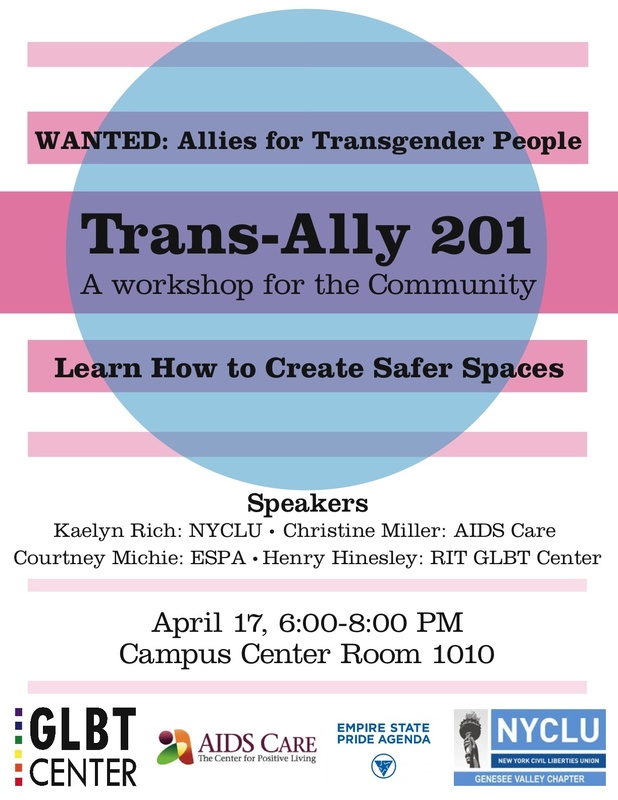 Trans-Ally 201: A Workshop for the Community on Tuesday, April 17 from 6:00pm-8:00pm at Rochester Institute of Technology in Campus Center Room 1010. 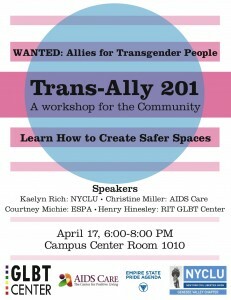 Learn how to create safe spaces for transgender people! You are an ally to transgender and gender non-conforming people. You care about issues that affect transgender people and you want to support the trans people in your life. So…what’s next? What else can an ally do? Join us for this interactive, thoughtful workshop about the role of trans-allies in creating safe spaces for transgender and gender non-conforming people. Find out what you can do to support the rights of transgender people and how you can take your role as an ally to the next level. Light refreshments will be served. Email geneseevalley@nyclu.org for more details. This event will be ASL interpreted. This entry was posted in Community and tagged #Activism, #ally, #LGBTQI, #LGBTQIawarenessmonth, #trans. Bookmark the permalink. I am not available that evening, but am very interested in connecting! Would it be possible to get some more information, hand outs, power points, anything would be most welcome. Thanks so much for all you are doing. Together, we WILL make a difference! SBAI did not organize the workshop, so we don’t have any materials on hand. However, we suggest emailing the organizers, geneseevalley@nyclu.org. Thanks for supporting an important cause and doing your part to make a difference!